Jose Mourinho has demanded that Real Madrid include both Alvaro Morata and Raphael Varane in any potential deal to sign David De Gea. According to reports in The Sun, Mourinho is ready to play hardball in order to get as much as possible out of Los Blancos, who are already willing to pay a huge amount in order to bring De Gea to the Bernabeu. The Spanish shot-stopper, who used to play for Real’s cross-town rivals Atletico Madrid, is understood to be keen on a return to his hometown. However, he has previously stated that he is content in Manchester, and it appears unlikely that he will force through a move to Los Blancos. The La Liga giants are reportedly willing to offer United a mammoth £60 million – a world record fee for a goalkeeper – in order to prise De Gea away from them. Mourinho though, is holding out for two of Real’s best young players in Morata and Varane, in exchange for Spain’s no.1 keeper. 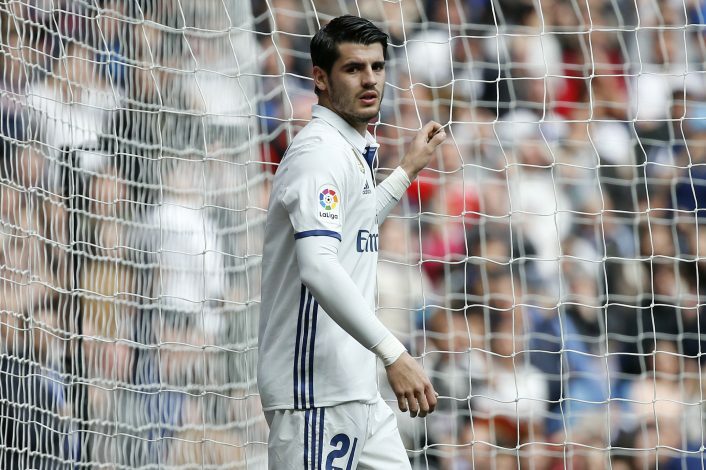 Los Blancos are said to be willing to let go of Morata, 24, who they value at around £50 million, but are holding a firm stance on their refusal to let go of Varane. The 23-year-old French center-back is highly rated at the Bernabeu and is seen as the future of the club’s defense. United have tried and failed with attempts to sign Varane before, and they are unlikely to be any more successful this time around. Real, on the other hand, have made several attempts to sign De Gea in the past but no deal between the two clubs materialized. The closest they came to bringing the keeper back to Spain was two years ago, when United accepted a deadline day bid from the Spanish giants. However, a reported faulty fax machine saw both clubs shift the blame on to each other, as the paperwork could not be completed in time, and De Gea remained at Old Trafford as a result. Real could have signed the 26-year-old keeper last year for half the amount they are currently offering, as De Gea had a £30 million buyout clause on his contract at the time. The Spaniard has since signed fresh terms with the Red Devils, which has seen his value increase massively. United’s coaches are said to be unhappy about De Gea’s focus this season, and Mourinho would be willing to sell the shot-stopper to his former employers, as long as they agree to send at least one player the other way.